Like all of Max Elliot Anderson's books, this one kept me reading from beginning to end. Kurt and his two best friends Jordan and Riley are spending the summer working for Riley's father at the Bed and Biscuit, a kennel. Some of their clients leave their cats there daily. The Kitty daycare has brought business in. Riley's father is increasing the space in his kennels and is having a Christmas in July for his clients. There is a problem. Several people in the neighborhood have returned from vacations to find their homes have been burgled. Unfortunately most of those people had housed their pet at the Bed and Biscuit. Is there a connection? Kurt thinks there is. 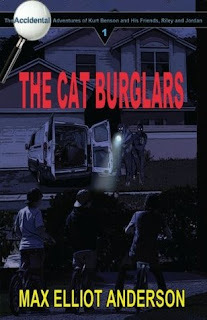 But what can he and his friends do to catch the burglars and save the "Bed and Biscuit"? One of the things I enjoy about these books is that even though there are several books in this series they all read like stand alone books. The mysteries are simple enough with enough twists and turns that even though I think I have it figured out I haven't. These are high interest for those who might not think they like to read. Looking forward to reading several more of these.